ThrillseekerVBL, Software limiter from Variety Of Sound. 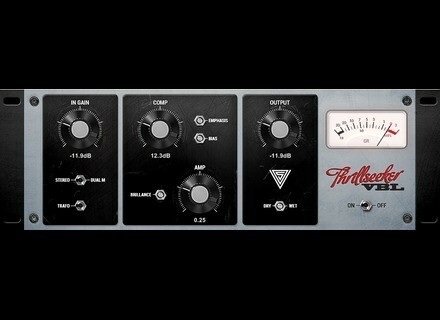 Variety of Sound will soon launch Thrillseeker VBL, a vintage broadcast limiter emulation plug-in. Thrillseeker VBL is based on the Variable-Mu principles initiated in the 1950's, which use gain modulation (Variety of Sound calls is Tone here) to manage sudden signal changes (initially to change a tube bias). VOS adds that this limiter is slower than a brickwall limiter. The plug-in is a "modified" version equipped with a gain reduction control, as well as quantity and appearance adjustments for the harmonic tube amp distortion. This will allow the user to slightly saturate the circuit and create harmonic distortion effects. Last, Thrillseeker VBL includes a transformer signal path simulation. No information about the availability, VOS announces sometimes in May. More details soon at varietyofsound.wordpress.com. MeldaProduction launched MWobbler MeldaProduction announced the release of MWobbler, a distortion filter plug-in for Mac and Windows available for the introductory price of 20€. A mastering App soon on the iPad Igor Vasiliev, in partnership with Andrew Startsev, announce the soon release of the Audio Mastering Studio app on the iPad.